WordPress.com’s default theme for 2015 is the perfect canvas for your creative vision. 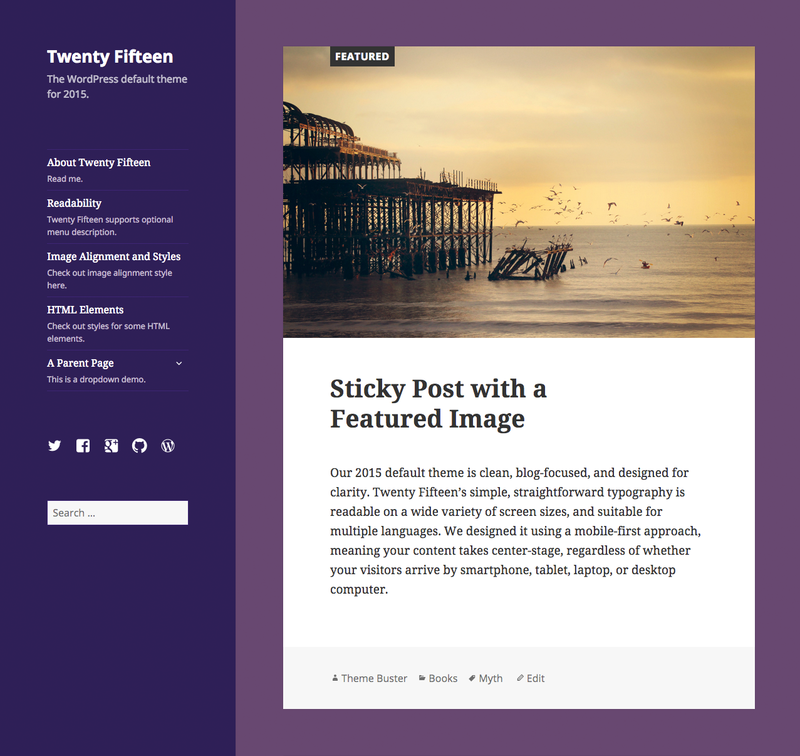 Our default theme this year, Twenty Fifteen, draws visitors’ eyes to what matters most — the text and images you publish on your site. Crisp typography, generous spacing, streamlined navigation: Twenty Fifteen shows that less can indeed be more (and that it can look great on any device). 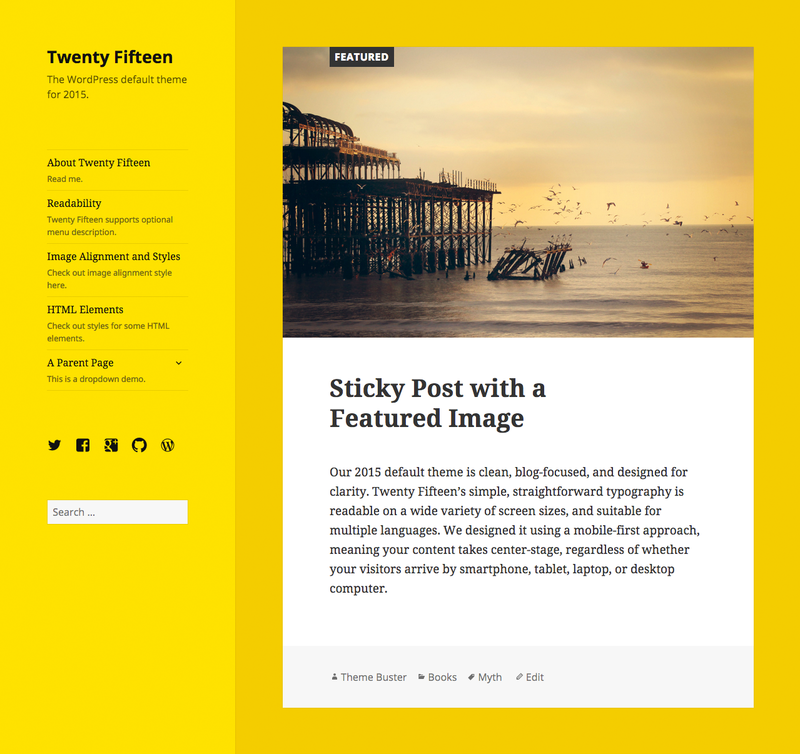 Keeping things simple and streamlined doesn’t mean you can’t make a theme your own, of course. 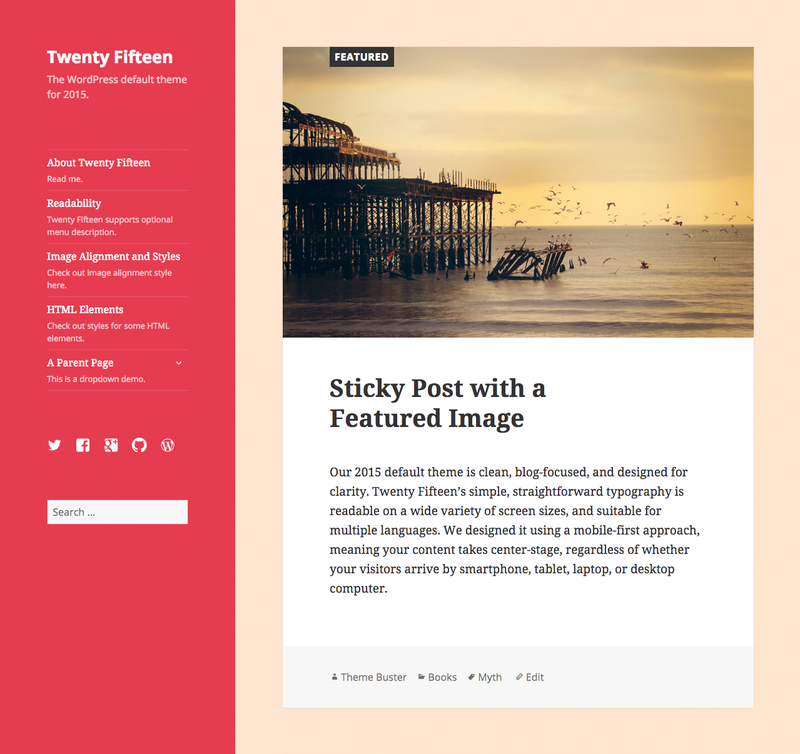 From free custom color schemes (pictured in the gallery above) to a vertical header area with ample space to channel your (and your site’s) personality, Twenty Fifteen is a theme that invites you to express your creativity. Here are three sites that are doing a superb job using the theme as the canvas for their vision. Desertification is a blog on environmental change, sustainable gardening, and other topics relevant to drylands everywhere. The Belgium-based blogger behind it, Dr. Willem Van Cotthem, crafted a design that matches the topic perfectly: the custom header image shows the harsh beauty of the desert without compromising the readability of the easy-to-navigate custom menu. The site’s well-selected featured images round out an inviting look that brings to life its fascinating subject matter. With a perfect balance of minimalism and color, Alfitude, a music blog focusing on emerging artists from Scandinavia (and beyond), exudes effortless cool. A bright white background sets the tone, and custom fonts (available through the WordPress.com Premium upgrade) add a subtle, sleek touch. Alfie Hanoun, the site’s editor, made sure that finding music on his site is a breeze with a well-designed custom menu. Keeping with the minimalist aesthetic, the only other additions to the sidebar are well-placed links to the site’s social accounts, and an Image Widget featuring the site’s logo. Potter Michelle Luu‘s blog might be just a few weeks old, but you wouldn’t guess it judging by the site’s professional-looking design, which adds a few smart custom touches to Twenty Fifteen‘s out-of-the-box look. Gorgeous featured images set the tone (and look particularly striking against the theme’s neutral default background). Michelle also added links to her About page and Etsy store, and links to her Facebook, Twitter, and Instagram accounts — all crisply displayed in the uncluttered sidebar. An About.me Widget — featuring an image of Michelle at work on her potter’s wheel — makes the space even more inviting, and imbues it with Michelle’s presence. Have you seen other great sites using Twenty Fifteen? Have you tried customizing it yet? We’d love to hear from you in the comments. I’ve been using this theme at my blog repressd.me. Love it! Awesome ways to spice up your blog! Thanks! This one looks like a winner! The cleaner and simpler the better for composing bloggers and our readers. Thanks! Regardless of the theme you use, a sticky post is set in the Post Editor. You can find detailed instructions here. A post set as sticky just means that it stays at the top of your posts page regardless of how many newer posts you publish. It’s a good way to keep information visible for your audience without letting new content drown it own. It doesn’t, however, affect the length of the text that is displayed from each post. To control that, you should consider using Excerpts — or, in case your theme doesn’t support Excerpts, the More Tag, which also lets you display just a specific portion of your post. Thanks! WIll keep this in mind as I fix my blog. I’m very confused as I can’t seem to find the free colour schemes. Help? Happy to help — in the drop-down menu in the top-left corner of the screen (“My Sites”), search for the Look and Feel section and click on Customize. This will open your site’s Customizer, where the first tab at the top is Colors. Click on it, and you’ll see the Colors panel opening — there, where it says “Choose a Palette,” you’ll find the five free featured color schemes. You can preview each one, and, once you’ve made your selection (if any) click Save, and you’re set. I can’t promise anything regarding next year’s default theme, though our track record is quite telling. Hi! I’m looking for a theme that will let me use an adjustable size header photo with a line of text underneath. Specifically, I need to have a photo with the title of the blog directly beneath it, with sticky post capability, multiple drop-down menus, and both right and left sidebars for widgets. The background must be customizable. Any suggestions? Is 2015 right for this? Thanks in advance, Ben, and anyone else who has ideas. The blog is called The Picky Proofreader–I’ve already purchased the domain, now need the theme to go with the concept! Here are the themes from our Showcase that feature three columns, a flexible header, custom header and background, and custom menus (for the drop-downs you’re looking for). You’ll see a good mix of free and premium themes there, so hopefully you’ll find one that matches your needs. It’s worth noting that even if you don’t find the exact desired layout for your header image and blog title, this can be worked around — for example, by creating a custom header image that already contains your blog title in the desired spot (something you can achieve in a couple of minutes on an image-editing tool like PicMonkey). Thank you thank you thank you! This looks like a winner. Thanks, Ben, I’ll give ’em a spin! Twenty Fifteen customized @ http://cyclingexperiences.com/ I love it! THANKS!!! If you like black themes, take a look at mine. I think I nailed it. Just switched to it from Wilson. I’m very happy with TwentyFifteen. It’s simple and visually appealing at the same time. Looks like an awesome theme. Thanks for Twenty Fifteen, so uncomplicated. Just the way I love it. Twenty Fifteen is gorgeous and for the first time, I’m using it for all of my family’s websites. Each one has its own color scheme – bold and punchy. There’s mine, my daughter’s and my son’s. I love how unique they all are and how focused on content they are. Great theme. It’s the simplicity that I like. I started blogging this year and liked the default settings for twentyfifteen so I didn’t bother looking at others or customizing beyond a category list, but is there some way to turn off the function that hyphenates words at the end of a line? Your theme is set to auto-hyphenate long words at the end of lines. To change this, you’ll need to enter some CSS code into your site, which requires the WordPress.com Premium plan. You can read more about how this solution works in this Support Forums thread on the same question. Another workaround which doesn’t require the Premium plan is to enter some html code on each individual post or page where you’d like hyphenation not to occur. You can find more information about this solution in this Support Forums comment. Actually, I have been using it in my English blog. I changed over to this theme yesterday. It’s elegant and perfect in every way. Has all the features I like/use and beautiful readability and aesthetics! Thank you. Love it! Since I couldn’t find a way to personally thank you, I’ll do it here! Ben, thank you so much for featuring my blog. It was definitely a surprise! This is a wonderful theme for a clean, minimal look and super easy to use for a beginner like me. Thanks! My pleasure, Michelle! I’m really happy to have stumbled on your blog. Twenty Fifteen was designed to function and look great in all languages, including right-to-left ones like Urdu. For it to display properly, be sure to set the site in question to the correct language. From your dashboard, select the site you want to use Urdu in, click on Settings, and scroll down a bit until you see the Language drop-down menu. There, you’ll be able to change your language. Once you save your choice your theme will switch to right-to-left layout: for example, the sidebar will automatically move to the right side of your main content column. Is 2015 theme wordads support, i mean for additional ad units ? Thanks. Twenty Fifteen does support WordAds, but not additional ad units. You can find the list of optimized themes for additional units here (the list is updated automatically, so if Twenty Fifteen ever does offer these, it will show up there). Hi there, I have shipped a couple of post now. I wonder: a. How do I add a “share”-bar in the left field? b. Can I make a list of “Previous blogs” in the dynamic version, or is that only for the static? It gives a good overview. c. How do I change password for Admin – so that it’s not the original? Thanks! 1. It sounds like you’d like to add a social links menu to your sidebar (Twenty Fifteen displays them really nicely!). You can find detailed instructions on how to accomplish that here. 2. I’m not entirely sure what you’d like to achieve with a” previous blogs” list — if I understand correctly, you’re looking for a way to group together previously-published posts in a way that makes it easier for readers to find them. There are several way to go about this, for example by creating category pages, or by adding an Archives Widget to your sidebar. 3. All the info on changing passwords can be found here. I’m really happy to hear you’re enjoying Twenty Fifteen — good luck with your new blog!